Gary was gone Wednesday night on a winter camp out in Manning Park. They were able to build snow shelters and weren't too cold in the crazy snowy weather. I have to say that without Gary to take Koen for an hour at night, I was exhausted. Koen likes to be awake from 9pm-1am and it is so tiring, especially since I am unable to nap during the day. Yesterday I kept him up more during the day and it made for a MUCH better sleep. I put him in cute big people clothes yesterday but then decided that a sleeper is easier and better and that's what I'll keep doing for the next few weeks. Gary's mom did take Kai on Wednesday and boy, life is a lot easier without a toddler! I didn't realize how much talking Kai does. It takes a lot of energy to talk with, change, feed, and entertain a 2.5 year old! I went shopping and it was so easy with just Koen asleep in the car seat! 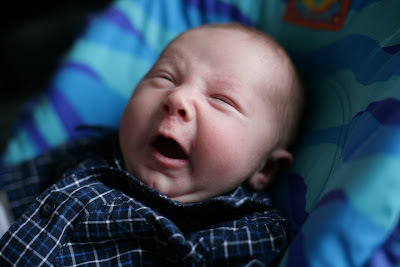 I've looked into Koen's tummy troubles and it may have to do with my foremilk/hindmilk imbalance. Basically, he is getting too much of the first milk that is more watery and full of lactose and not enough of the fatty hindmilk. I've been feeding him, then burping and changing him, and then offering him more (from the same breast) so he gets more of the fat to balance out the lactose. If he wants to eat more than once in a 3 hour period, I give him the same breast (that appears empty but isn't I guess!). So far, no puking in 48 hours and he is also way less gassy. I have also cut dairy out so I don't know which one it is due to. I would love to have a bowl of cereal sometime soon! Okay, so once he is asleep for the night, he will wake to feed and then goes back to sleep nicely. This is awesome. Seriously amazing. I know what the alternative is like so I def. appreciate it! During the daytime, its harder to get him to sleep. If I put him in the bjorn, he is asleep in 10 minutes. However, I don't know if I want to have to rely on `props' to get him to sleep as that was what we did for Kai for 4 months. I also don't want to carry a sleeping baby for 2 hours at a time. He is def. way more alert during the day so he isn't just falling asleep anywhere anymore. However, he still really likes sleeping on his belly so maybe I will do that for naps and continue to put him to sleep in his carseat at night. Hopefully in a month or so, I will feel more confident letting him sleep on his belly at night. Kai is testing me. Wow. He is tiring. And annoying. I love him and am so proud of him but boy, thank goodness this stage won't last forever! For everything I ask, he says he doesn't want it but two seconds later he does. He doesn't want to go anywhere and just wants to stay home. He says he's too tired to go play with Ani and yet when I get him there, he has the best time of his life. I know he's just trying to have some control over what's going on in his life but wow...so exhausting! I am so sick of changing his diapers but the idea of potty training while breastfeeding half of the day worries me a bit. I had planned on starting next week but now I'm thinking that if we waited until the summer, Koen will be on some solids (I won't be breastfeeding all day long) and Gary will be home full time...hmmm...what to do. I'm very happy that he has adjusted to Koen well and treats him nicely. Besides trying to poke him in the eye today, he is very gentle. Unfortunately, taking care of Koen makes it hard for me to play with Kai. We have discovered that playing volleyball or soccer with a balloon works well while I am feeding Koen. Also, we can play hide and seek or march around the house when Koen is in the bjorn. Funny how similar your life sounds to mine these days and that is so funny about the belly button. Mikayla's belly button is really funny looking so I am glad to hear that it will look normal in a few years!! You mention that you are going to start running in 2 weeks. I have been thinking about starting on Monday. (5 weeks pp) Did you run after your first c-section? How long did you wait? Last time (if I remember correctly! 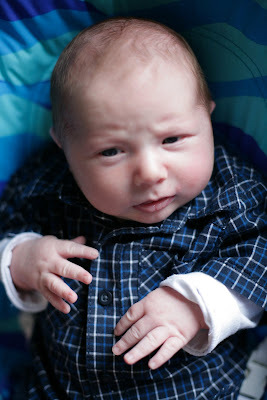 ), I had a football practice at 5 weeks but didn't work very hard. At 6 weeks, i went for my first run. I ran 5km at 8 weeks. I feel okay right now but i want to make sure everything is good internally before I try:) Hope yours goes well! Hope the breast feeding goes well!! Dr. jack newman. Good man. Louise - if your 2.5 year old talks a lot, just you wait till he's 4.5! And every. single. day. inbetween! You're on the right track with the breastfeeding. If your breasts are numbered 1 & 2, it's best to go 1-2-2-1-1-2, not just back and forth. And yes, I'd highly recommend you wait till the summer to really potty train. It's just a few more months, really. It's so much better with help, and fresh air! I can't believe you're thinking about running and football. It's so not my thing, but you are very inspiring. Maybe I'll start walking soon. Gotta get me some good walkin' shoes. hope the feeding situation gets better for you! 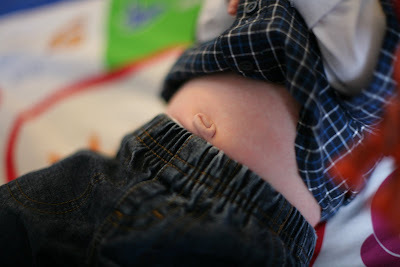 i know how you feel about koen's belly button, b/c asher's belly button looks the same. i think it was b/c they left his umbilical cord so long...but who knows. hope things with kai get easier too!